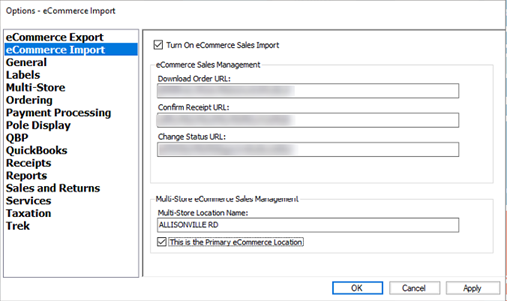 Select the eCommerce Import tab and check Turn on eCommerce Sales Import. In the Download Order URL field, enter the value from your eCommerce website provider. In the Confirm Receipt URL field, enter the value from your eCommerce website provider. The Change Status URL field is not currently used. (Multi-store retailers) In the Multi-Store Location Name field, enter the Location Name as specified on your eCommerce website. (Multi-store retailers) Check This is the Primary eCommerce Location at the location which should download sales which are shipped to customers.Sherpa Tip: Only check this option at one location. In-store pickup sales automatically download to the appropriate location.